As every year for the Easter holidays, the Monaco City Council organizes original egg hunts for children from 3 years old. Notice to our toddlers fond of chocolate, it is at the Exotic Garden of Monaco and at the Princess Antoinette Park that we will have to go! Saturday, April 20, 2019 at 10h and 11h, the Exotic Garden of Monaco will host the now famous hunt for exotic plants. The children, who will be given a plant by the organizers on their arrival, will have to find its twin hidden in the paths of the garden. By bringing back the two identical plants, they will be rewarded with a small bag of chocolate eggs (one bag per child). Two sessions are planned: one at 10am and the other at 11am. The number of places being limited, preliminary registration is required either by telephone (+377 93 15 29 80) or by email (jardin-exotique@mairie.mc). The entrance of the Exotic Garden of Monaco is free for the child – from 3 years – and his companion. Never change a winning team! 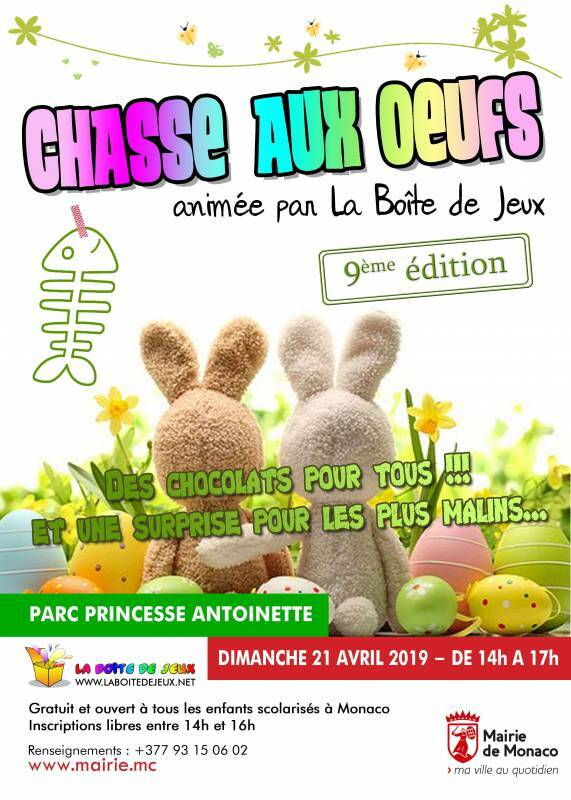 In collaboration with La Boîte de Jeux, the City’s Animation Department offers schoolchildren of the Principality (up to 12 years old) the 9th edition of the Egg Hunt in the alleys of the Princess Antoinette Park. Our little blond heads will have to work their brains through including playful workshops to leave the arms loaded with chocolate eggs! See you on Sunday April 21st, 2019, from 2pm to 5pm. On-site registration the same day.